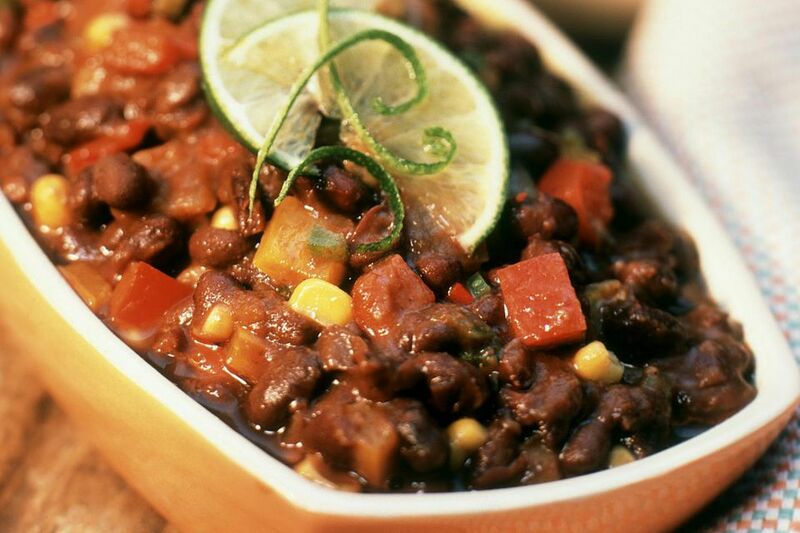 This healthy and delicious vegetarian chili recipe made with black beans and lots of veggies cooks in your slow cooker. It's easy to make and colorful too. You can use other types of beans in this chili recipe if you'd like. Try using pinto beans, or kidney beans, or even garbanzo beans for a nice change of pace. By the way, any chili recipe really combines already cooked ingredients. Cooking blends together and enhances the individual flavors. In a heavy skillet, saute the onions in the olive oil until tender, stirring frequently, about 4 to 5 minutes. Add the garlic and cook 2 minutes longer. Add the cumin and cayenne pepper, and whatever other spices you might like. Cook for two minutes longer to bloom the spices. Cover and cook on low about 10 hours or until the vegetables are tender. You can thicken this chili if you'd like using a mixture of about 2 tablespoons cornstarch with 1/3 cup water. Add to the slow cooker, cover, and cook for 20 to 30 minutes or until thickened. If you have a newer, hotter cooking crockpot, cook the whole recipe on low for 6 to 7 hours.